When I go back home to London, I inevitably end up on Brick Lane. The plethora of curry houses concentrated onto one street in the capital has always spoken to my foodie soul, and it’s always an adventure trying new places and haggling the best prices. Although some restaurants are better than others, you nearly always leave with your taste buds satiated, your stomach full, and your wallet without a gaping hole in it. And then I come back to Oxford. While I now prefer the city over my home town (I like being able to get from A to B on my bike in under twenty minutes, rather than spending an hour on the tube, okay? ), its biggest fault, in my opinion, is its lack of easy-to-find, student-budget-friendly curry options. I thought I would try a few out to see which one, if any, could become my new “local”. 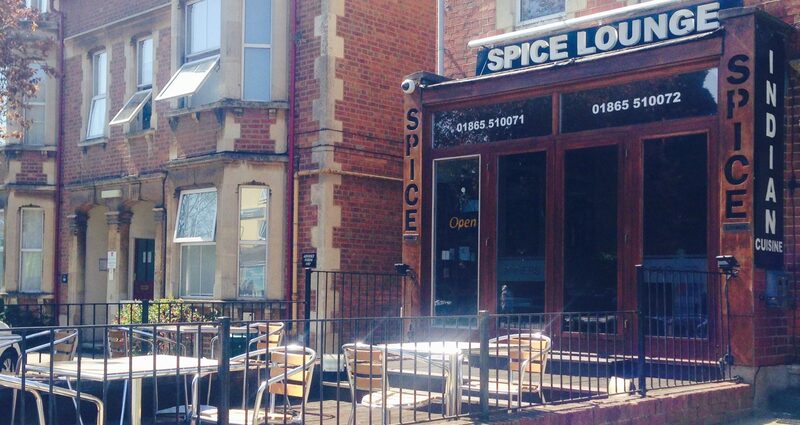 I started with Spice Lounge in Summertown. The prices looked decent and the menu expansive. I had high expectations. My boyfriend and I ordered poppadums and chutneys to whet the appetite, and samosas to begin to fill the voids in our stomachs. We were so hungry that at this point we didn’t stop to consider the price. Then we came onto the mains. Al went for his usual choice, the chicken bhuna, which at £8.95 was no different to the prices we’ve come to expect from the à la carte menus on Brick Lane. I was feeling some variety and so I opted for two veggie sides, the kodo saag (spinach and pumpkin – or, rather, butternut squash) and the chana baigon (chickpeas and aubergine), which together came to £9.50 – also not bad for two side dishes. But we needed something to go with these curries, and we were surprised to find the rice and naan more expensive than we’d anticipated. Sure, the plain naan was only £3.15, but this was nearly 150% more than we’re used to. I’m aware that in the grand scheme of things we were being pedantic – the difference was only about a pound, after all – but we were on a mission to find the perfect Oxford curry house, and at this point our curry-seeking, student-budget principles were feeling somewhat uneasy. Over the course of the meal, it became apparent that this feeling wasn’t just a case of naan-pedantry, but was actually justified. Over the course of the meal, it became apparent that this feeling wasn’t just a case of naan-pedantry, but was actually justified. We reflected – the samosas and sundries had also been a little more expensive than what we were used to. But the real issue lay with the curries. Yes, they were delicious, and my taste buds felt truly nourished, but my stomach did not. We were used to struggling to finish our curries due to their sheer volume, but here the portion sizes were so small that we didn’t leave a bite. It was the first time we had left a curry restaurant still hungry. It was a strange feeling. Overall I can’t fault Spice Lounge for its food – the menu is broad, the food is delicious, and the chefs clearly know what they’re doing. But it didn’t have the comfort factor we were looking for, the sense that they want the customer to leave contented and well fed. Ultimately we found that the meal, although delicious, wasn’t great value for money – the higher prices for starters and sundries didn’t reflect better taste in these areas, while the small portion size of the otherwise decently-priced curries was a disappointment. The verdict? The Spice Lounge isn’t the kind of curry place that can be accommodated regularly on a frugal student budget. However, if you have a special occasion you wish to celebrate with a curry, then it will do the job perfectly. Indeed, when, a few weeks later, my boyfriend’s parents asked us to join them for lunch at Spice Lounge, we didn’t hesitate to accept their invitation. You just need to be prepared to order a little more food, and therefore spend a little more money, than you would do on Brick Lane.